Get out your party shoes, send out those invitations, and return those RSVPs; the festive time of year has arrived! The parties will surely be plentiful! Let's see, you'll have the work party, a family gathering, the old friends get together, and of course don't forget the yearly charity event! With all of these parties, the tough part is keeping things fresh and exciting. Here are some tips to help you stage a fresh, modern holiday party. 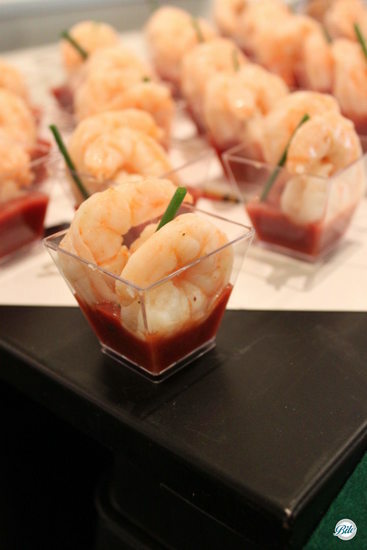 There are two key elements to a cocktail party: the cocktails and the food! You might think you can get away with having a foodless cocktail party, but about an hour in you will see that you have made a terrible mistake as your guests begin to kick off their shoes and clear a space on the table top for a dance floor. A popular approach for today's cocktail parties is to choose a few select signature drinks. Rather than having a full bar, which can be quite costly, you choose two or three drinks to go along with the theme of your party. Set up drink stations for your various signature drinks! Let's say that your drink menu is: artisan craft beer, local wines, Bellinis, and martinis. You can create three stations out of this menu and accompany each drink station with a stationary appetizer or two. The first station is your beer and wine station. Cover the table with a linen and some holiday decorations. Arrange the beer and wine on the table along with the appropriate glassware. Create markers with the name and a brief description of each beer/wine so people know what they are drinking and are more inclined to try something new. 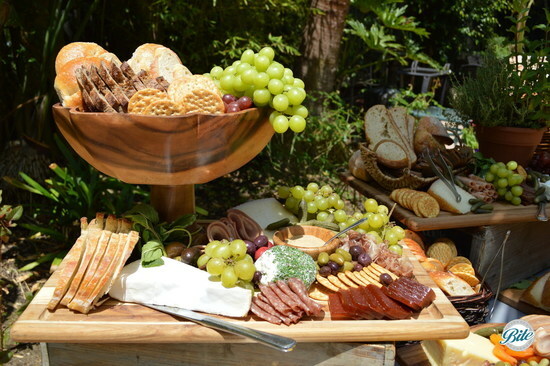 Accompany the beer and wine with a beautiful display of artisan cheeses, fresh fruit, nuts, breads, and crackers. 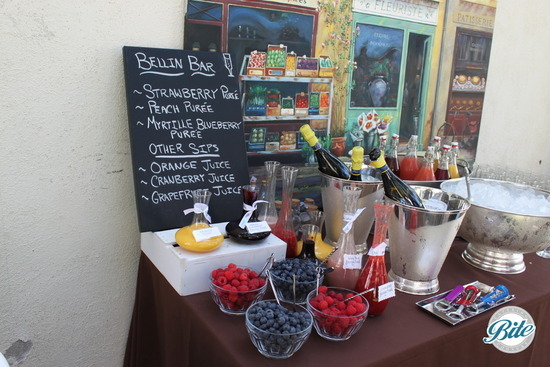 The second station is the Bellini bar. This station has Prosecco and some fruit purees so people can create the flavor of their choice. Popular Bellini flavors are pear, cranberry (or mix the two for a great pear cranberry flavor), peach, and mango. Again, arrange the table with a linen, decorations, bottles of Prosecco, and you can have fun filling up assorted mason jars or pitchers with the various fruit purees. The colorful fruit purees make a lovely display on their own. Have fun making a sign letting people know how to prepare their own Bellini. Add a plate of assorted crostinis with seasonal flavors and colors to accompany the Bellini station. One of Bite's winter favorites is pear and winter squash with crispy sage and freshly shaved ricotta salata. Finally, have fun creating a martini station. Offer a traditional gin or vodka martini, a cosmopolitan, and something fun and sweet like a lemon drop or an apple martini. You can offer one, two, or all of them at this drink station. A Brie and artichoke dip and a spicy shrimp cocktail would work perfectly here. Accompany the stations with some warm tray-passed appetizers or you can keep it casual and self-serve with the stationary displays. Either way, your guests will be sure to enjoy the creative and festive atmosphere, and your tables wonâ€™t show marks from those dancing shoes! 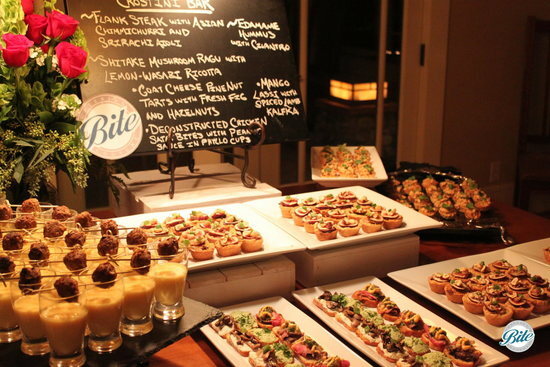 Give Bite Catering a call to help you plan your next Holiday Party.